Grooming Your Bikini Area: The Best Alternatives To Waxing! Every girl wants a groomed bikini area and waxing may be a super common choice, but what if you just cannot stomach the thought of hot wax down there?! Don't worry, you’re not alone, girl! We give you a few alternatives to keep your pubic hair in check with these grooming methods. It’s the easiest way to get rid of hair anywhere, and your lady parts are no different! If you don’t want a stranger touching your privates and are apprehensive about applying chemicals down there, then shaving is your best bet, although your hair will grow back much sooner. Just remember to do it carefully, shaving in a rush is never a good idea. Keep the following points in mind! If it’s your first time or you haven’t shaved in a long time, trim the hair first with a clean pair of scissors. Definitely apply shaving gel or cream first for a smoother shave. Keep your legs open, gently stretch the skin and shave in the direction of hair growth. Also read: 8 Things You MUST Do Before Getting A Bikini Wax! These are a great option if you want to tidy up the area or keep your bikini line in check. Depilatory creams use chemicals to dissolve the hair, which can then be wiped away easily. It’s another painless method without the hassle of shaving creams or razors. Just make sure to choose the right one, one meant for sensitive skin would be a good idea for the area. Always do a patch test before going to town on the area, just to be safe. You don’t want an uncomfortable reaction down there for sure! Simply apply it on the area for the recommended amount of time or less. If it says 10 minutes, it’s safer to wash it off after 7. Definitely do NOT leave it on for longer than instructed as that will cause irritation. Don’t use it to remove all your pubic hair. These creams contain harsh chemicals, so they should be used only on the excess hair and not anywhere near the more sensitive spots like the labia. It has become quite a rage as it gets rid of most of the hair almost permanently. It may be expensive, but if you think of its super long-lasting effects, it’s pretty economical. A medical expert uses a laser beam to burn the hair follicle, which helps reduce hair growth. Just remember a few things. Don’t plan on getting it done during your period. It will require multiple sessions. Make sure to visit a reputed professional. The frequency of the laser used is determined by the skin colour and thickness by hair, by an experienced professional. Also read: 10 Things Your Bikini Waxing Lady Wants You To Know! Another at-home method of getting rid of unwanted hair, epilation removes hair from the root, which means you can stay hair-free for up to a month. It also leaves your skin feeling super smooth. The only downside is that it’s a painful process. But then again, at least you don’t need to get it done from a stranger. 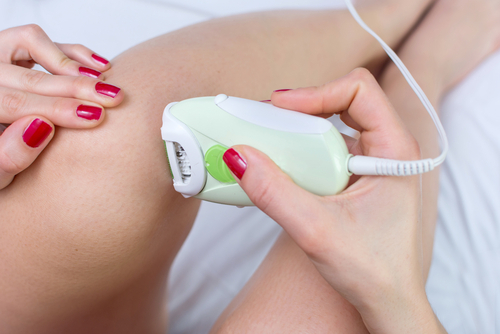 All you need to do is purchase an epilator, which can be expensive but worth it in the long run, and do it at home. We suggest this one from Braun. Take a warm bath before you start to soften the hair and help reduce the pain. Epilate in the direction of hair growth. Make sure to moisturize afterwards.